The transmission and processing of signals carried by optical beams rather than by electrical currents or radio waves has been a topic of great interest ever since the early 1960s, when the development of the laser first provided a stable source of coherent light for such applications. Laser beams can be transmitted through the air, but atmospheric variations cause undesirable changes in the optical characteristics of the path from day to day, and even from instant to instant. Laser beams also can be manipulated for signal processing, but that requires optical components such as prisms, lenses, mirrors, electro-optic modulators and detectors. All of this equipment would typically occupy a laboratory bench tens of feet on a side, which must be suspended on a vibration-proof mount. Such a system is tolerable for laboratory experiments, but is not very useful in practical applications. 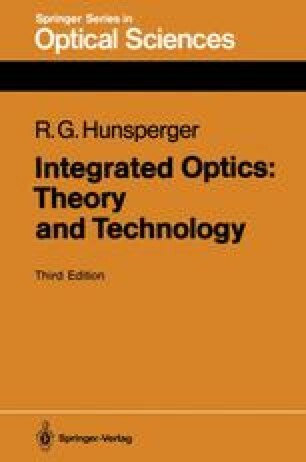 Thus, in the late 1960s, the concept of “integrated optics” emerged, in which wires and radio links are replaced by light-waveguiding optical fibers rather than by through-the-air optical paths, and conventional electrical integrated circuits are replaced by miniaturized optical integrated circuits (OIC’s).